Canela Lemoine's hand-stamped bangles are a sweet way to let a loved one or mom know you appreciate them. When it comes to your loved ones, you're linked for life. 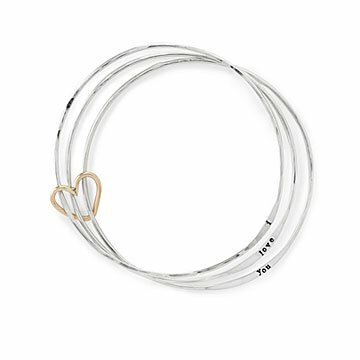 Canela Lemoine's sweet designs represent that eternal bond with two sterling silver bangles held together by a 14-karat gold heart. Our favorite part: the hand-stamped hidden message. Choose a warm "I love you" for best friends, a grandmother, or sister. Or, thank mom for her constant support with a loving "Best mom ever." Give the piece to a jewelry lover for their birthday, a special occasion, or just because you care about them. Handmade in California.